The need for Java developers is on the rise. Java continues to be the most or one the most popular programming languages. It is a leader in mobile platforms (Android applications are built with Java) and there is a shortage of engineers with Java coding skills. All of that affects the job market and the average Java developer salary. Let us take a closer look at what Java developers do and why there is such a demand for their expertise. What is a Java develoepr responsible for? A Java developer is responsible for the design, development, and management of software and applications using Java, a widely-used, general-purpose programming language. Java is also an older language, developed in 1995 with the syntax of C and C++. Since then, it has grown massively in popularity thanks to its speed, platform independence, security, and wide range of libraries. This concurrent, class-based, and object-oriented language is designed to have as few implementation dependencies as possible. It was built with the philosophy of ‘write once, run anywhere’ (WORA), which means that code in Java can be written on one operating system and then run on another one with no necessary modifications. It is possible thanks to the Java Virtual Machine (JVM) that executes the Java bytecode. Today this classic of enterprise computing is a part of Oracle. The day-to-day tasks of Java developers vary depending on the project and their level of experience and ownership. Moreover, their skills can be versatile enough to oversee the full software development lifecycle. All of that makes a difference while negotiating a Java developer salary, which also depends on the location and specific needs from the organization. We have analyzed data presented by PayScale, Glassdoor, and Indeed: the most popular and reliable services that provide up-to-date information about salaries, benefits, and compensation. What factors (other than location and experience) can increase a payment. According to PayScale’s data, the average Java developer salary in the US stands at $73,305 per year. The average Java developer salary presented by Glassdoor is visibly higher: it’s $88,116 per year. 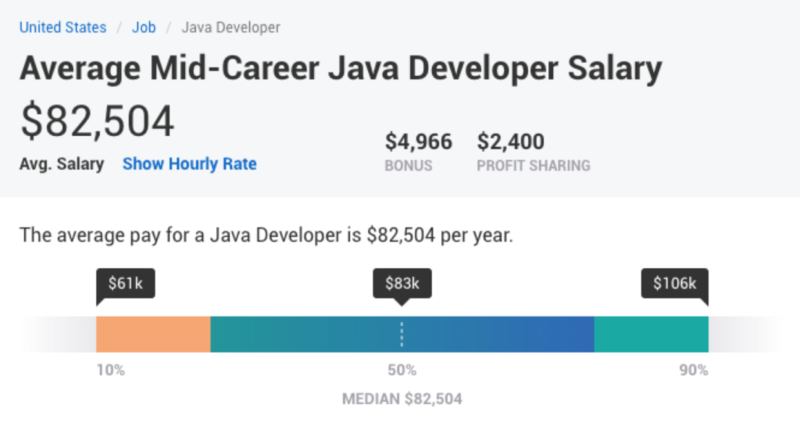 Indeed shows the highest average Java developer salary, which is $102,633 per year. It is not surprising that salaries can vary a lot depending on experience. It is easy to assume that an entry-level Java developer salary is lower than average and much lower than a senior Java developer salary. Numbers provided by the above-mentioned services confirm these assumptions. According to PayScale, an entry-level Java developer salary stands at $66,828. 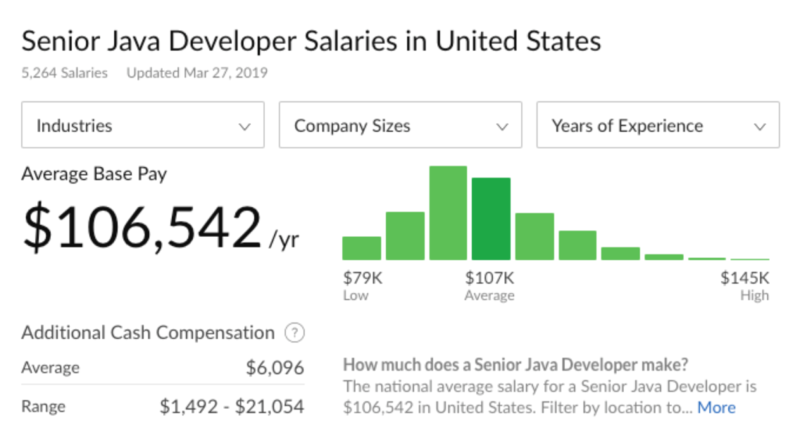 Indeed, contrary to the average Java developer salary which was much bigger there than presented on PayScale, indicates a similar number: $67,469 per year. Glassdoor’s data is also similar and stands at $69,418 per year. Many companies don’t distinguish between junior and entry-level employees, that’s why an average junior Java developer is only slightly higher than an entry-level. PayScale provides data only for entry-level, mid-career, experienced, and late-career professionals. We may assume that a junior Java developer salary is in between an entry-level shown above and a mid-career which stands at $82,504. According to Indeed.com, junior Java developers earn, on average, $72,150 per year. The number provided by Glassdoor is slightly higher: $75,697 per year. 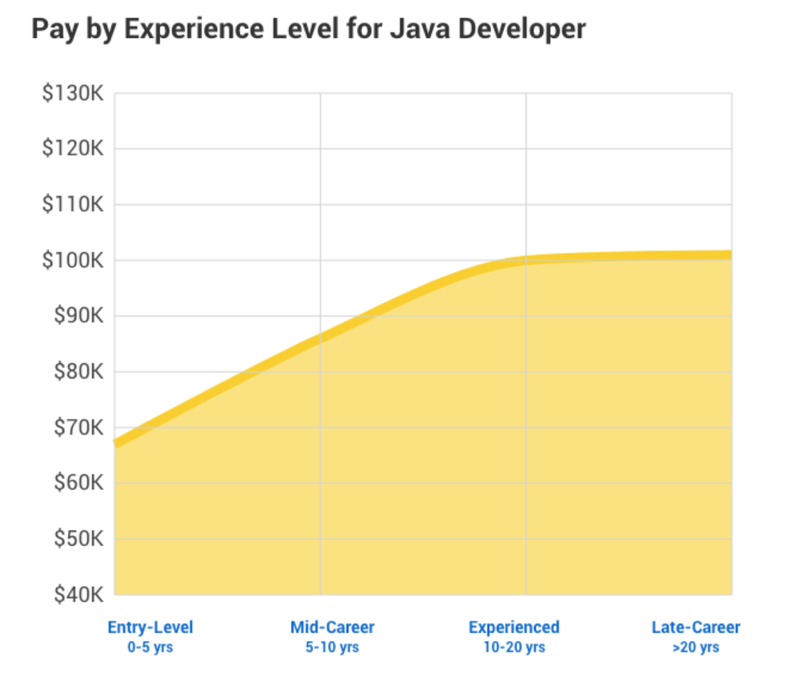 It is also no surprise that senior Java developer salary is higher than average. Usually, senior developers not only have wide skill sets but also experience that allows them to see the big picture and manage the entire lifecycle of the project. PayScale shows that an average experienced (senior) Java developer salary stands at $95,831. According to Indeed, it is higher: $122,640 per year. Glassdor’s data is in between, an average senior java developer salary stands at $106,542 per year. As you can see below, Java developer salaryaries increase according to the years of experience. more than 20 years of experience (senior to late-career): $101,000. more than 15 years of experience (late-career): $116,825. There is one more interesting source, ZipRecruiter, that doesn’t provide statistics and an average Java developer salary, but allows you to see what salaries are the most common. According to it, the biggest number of American companies offers around $90,000 per year. Location makes a significant impact on salaries. According to PayScale, a Java developer salary in NYC is 10% higher than a national average. It is not the highest salary in the United States though, as Java developers earn more in San Francisco, Seattle, and Washington (respectively 17%, 17%, and 12% above the average). Washington, DC: $86,990 (1% below the average). As presented above, a Java developer salary depends a lot on the level of experience and location. Let us not forget, though, about other factors which have an impact on salaries, like core and additional skill sets. They also vary among different projects. For example, Java-based web applications require a slightly different skill set than networking or distributed applications. Here is a list of the core skills that Java developers are usually supposed to have. They are a foundation that can later can be supplemented with additional skills. Java developers often work on complex applications that require excellent soft skills, especially top-notch communication skills are also a must and a factor that makes an impact on salary. The pay also depends on a career path that Java developers decide to choose. Among other roles, they can become senior Java Developers, Software Architects and then Senior Software Architects, Lead Software Engineers, Software Engineering Managers, and Project Managers.